Epson Stylus Photo RX500 is a 6-Color All-in-One Ink Jet Printer (Cyan, Light Cyan, Magenta, Light Magenta, Yellow and Black ink). No messy or time-consuming cartridge refilling. 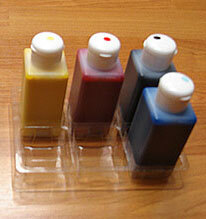 Smart Auto-Reset Chipset to control ink level. No more persistent nozzle blockages. High Page Yield, Low Cost. Easy to refill, no syringe required.